Finally, the long-awaited release of the full version of Art in Game’s AirAttack is upon us. 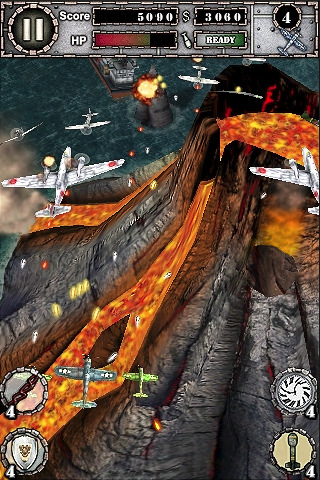 A vertical-scrolling, top-down shoot-’em-up, AirAttack is like an evolved version of the popular classic arcade game 1942. You’re the pilot of a single fighter plane, whose missions pretty much boil down to one directive: shoot down and destroy all the enemies in your flight path. To fly the plane, you have four types of controls: Touch, Relative Touch, Tilt, and Joypad. These can be found under Settings, and can also be switched while you are playing–just hit Pause. Personally, I prefer the Touch option, as I feel it gives me the most control; maneuvering through the air is as simple as sliding your finger. But as fun as it is watching your plane roll through the air, you still have all of your enemies (and their rather significant amount of firepower) to worry about. There are a total of 8 missions, each with its own boss fight at the end, and 58 different enemy types in all. Sometimes the air is so thick with firepower that damage to your plane is imminent. But there are plenty of upgrades for your own weapons and plane, both during the game and at the floating shop that pops up after finishing a mission. In-game upgrades, ammunition, money, and more will appear after destroying certain enemies: fly through them to collect. You can also collect bonus points by destroying enemies with bombs, which you deploy with a double tap (make sure your bomb meter has fully loaded before you try). It’s not my favorite method of destruction because it seems very imprecise to me, but it does make a satisfying explosion. Make sure to keep track of how many lives you’re losing. Hands-down the best feature of AirAttack are its 3D graphics. Realistically rendered and often just flat-out stunning, it’s hard not to take a breather in the action just to admire the art. With so much going on on-screen, you’d think there’d be lag, but the game ran without a single hitch or crash. Add the graphics with responsive controls, an epic soundtrack (it sounds like it should be featured in war action movies), and addictive gameply, and you’ve got yourself a winner. It doesn’t take a genius to play AirAttack, but it’s simple directive only adds to the beauty of the game. I would dearly love to see more mission added to the roster, because 8 just isn’t enough. It’s difficult to believe that this game is only $0.99–the graphics are top dollar. Do yourself a favor and at least try out the Lite version of AirAttack…you can thank me later. AppSafari review of AirAttack was written by Julie Guan on July 29th, 2010 and categorized under Action, App Store, Featured, Fun, Games. Page viewed 4416 times, 1 so far today. Need help on using these apps? Please read the Help Page.